In 185 AD, Chinese astronomers recorded the appearance of a new star in the Nanmen asterism - a part of the sky identified with Alpha and Beta Centauri on modern star charts. 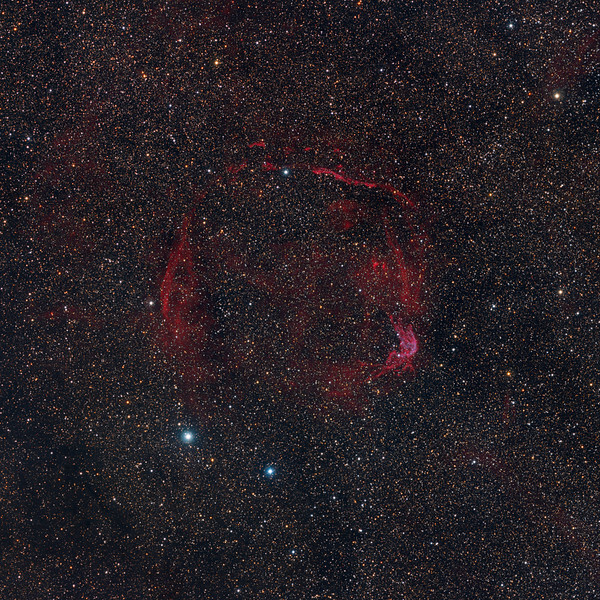 The new star was visible for months and is thought to be the earliest recorded supernova. The gaseous shell RCW 86 is probably the supernova remnant of this event and has a relatively large angular size of roughly 45 arc minutes (larger than the apparent size of the full moon). The distance to RCW 86 is estimated to be 9,100 light-years. Recent X-ray studies show a good match for the expected age. New infrared observations from NASA's Spitzer Space Telescope and Wide-field Infrared Survey Explorer (WISE) reveal how the supernova occurred and how its shattered remains ultimately spread out to great distances. The findings show that the stellar explosion took place in a hollowed-out cavity, allowing material expelled by the star to travel much faster and farther than it would have otherwise (text adapted from Wikipedia).